Your pet’s feet are vulnerable. 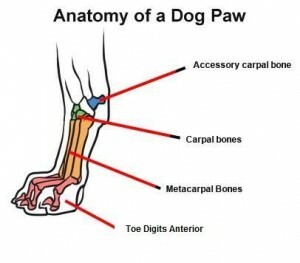 When we think about the anatomy of a dog’s foot, it’s not at all unusual to imagine that our pets stand on pointe all the time. 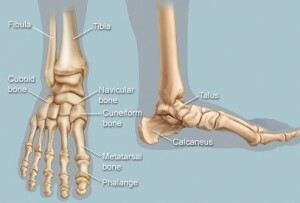 The human foot seen below, shows how we walk on the flat of our foot. We spread our weight from our ankle, across the metatarsals (that’s the long flat part of our foot) and onto our toes (phalanges or digits). What impact does this have on our pets? Long nails can impact on the comfort of the foot. The fat pads on the base of the foot act like good shock absorbers on a pair of expensive running shoes. If the nails are too long, the shock waves go up through the nails and bones rather than being absorbed by the fat pads. How do I tell if the nails need cutting? While your pet is standing on all 4 paws, a piece of cardboard (e.g. from a Weetbix box) should be able to be slid between the ground and the nail. If not, the nails are too long. You may cut the nails at home yourself, but watch out for the nerve and the blood vessel that run below the surface. Just like in our nails, we can only cut off the “dead” nail. Alternatively the nurses or vets at Vet HQ may clip the nails for you. Different prices apply. Please phone for an appointment. Sore toes can make your pet very, very lame. When we get a sore toe, we are able to still put our foot down, but sometimes we are forced to walk on our heal or side of our foot. Dogs and cats walk on their toes only, so a sore toe can mean holding the paw in the air or a considerable limp. Sore toes can occur because of toe bone fractures, nail bed infections, cat fight abscesses, dermatitis between the toes or even foreign bodies eg a piece of glass. 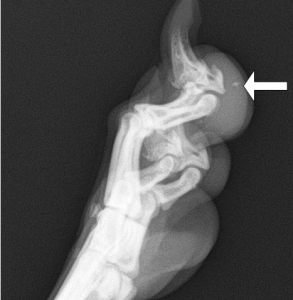 A nasty cat bite abscess in the paw. Notice the intense swelling of the foot. A grass seed in between the toes will cause redness and swelling. There may be excessive licking and chewing of the toes. In all of the above cases, the dogs and cats in question were very sore on their feet. Limping, licking and holding the foot in the air are all signs of discomfort. 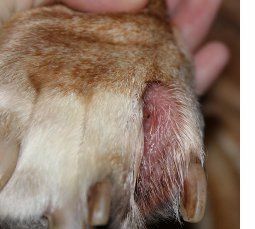 If your pet is showing these signs, do them a favour and have a Vet check them out. 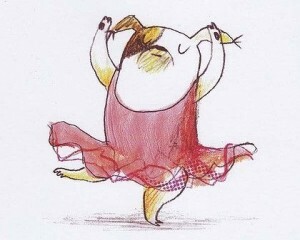 We all know how awful it is to have sore feet….. especially if you are a ballet dancer!! 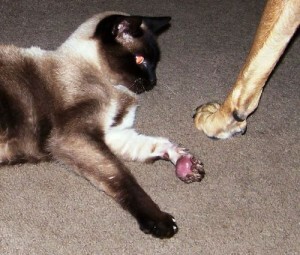 In comparison, the dog foot shows that the dog walks on tip toes all the time.